This entry was posted in Uncategorized and tagged 2012 Election, Conservatism, Health Care, Obama, Romney by Kirk Petersen. Bookmark the permalink. foreign affairs — the most important arena for any president. It’s quite another to annex one-sixth of the nation’s economy without a single Republican vote in either house of Congress. what, it was better for Repubs to block single payer, which successfully works for Medicare because of low administrative costs, or government facilities, which work well for the VA, in the name of CHOICE?? and because it BLOCKS COMPETITION? I think we should have those choices. In addition to private. And let them all compete. Kerry was chosen by the Dem machine when they thought that military service and heroism would be the differentiator, and lies from the Right were compounded by weak pandering by a weak candidate. Many of us knew in truth he was an admirable man and Dems voted for him. They just couldn’t get any other support. The Jim Crow-era corruption of the vote in Ohio was shameful and might have made the difference. the Democrats should bank on the religion issue. 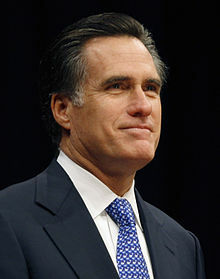 Romney is disliked by 75% of both parties for his sniveling public persona and pandering. If he had any integrity he might have been the perfect Democratic candidate. The Repubs want a revolution and will have Newt. Your endorsement I’m afraid is DOA. I wouldn’t count Newt out, because the Dems want one too and won’t get it with the sitting prez. I could see it. I might vote for Newt myself. I can’t divine Chris Christie’s intention. If he ever wants to be prez, he might have made a strategic mistake this year. Like where Bush dishonorably character-assassinated McCain in South Carolina, and Powell declined a run at Clinton or Gore, Christie might have missed his time. Newt might win and be an incumbent in 2016, and Christie would then have a better chance 8 or 12 years later when he then might stink from being around too long, like Cuomo did. Then again, he might be perfectly positioned for 2016. Repubs tend to wait in line for a nomination. How the heck did Nixon rise again after losing. Maybe never again.